Go Heavy With Your Abs This Offseason! Strength coach Cade Cowdin's approach to building thicker, stronger abs during the fall and winter will make you the envy of the beach by summer. It might help you hit big numbers on the major lifts, too! Perhaps your goal this fall and winter is to add 20 pounds of size and grow your deadlift by 50 pounds. Maybe you'll beef up your bench press and squat or add an inch to your arms. All of those goals are within reason with a solid offseason training program and mass-building nutrition strategy. So, what are you planning to do with your abs during that time? Aside from watching them disappear, of course? It turns out those same heavy-weighted workouts that are critical for fueling muscle and strength gains in your back and legs can just as easily be applied to your midsection. A stronger core will have plenty of value once you start adding plates to those heavy deadlifts and squats, because of the greater force you'll need to stabilize your torso. 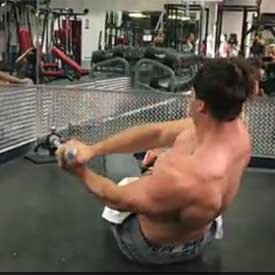 You'd better believe that being able to hold your spine in a neutral position will help you out during a grueling heavy set of bent-over rows. What's more, a dedicated offseason approach to ab (and core) training will allow your six-pack to stand out in greater relief and really pop the next time you diet! 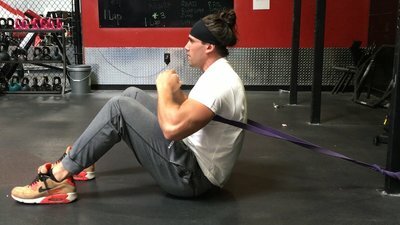 So if your ab workout consists of a few sets of crunches for 20 reps, try this approach and program that focuses on building offseason abdominal size and strength. Many competitive bodybuilders will tell you they rarely do dedicated abdominal exercises, because their midsection muscles already work overtime during all variations of heavy multijoint exercises like squats, deadlifts, bent-over rows, and overhead presses. While many of these exercises require more of an isometric rather than an active contraction in the core musculature, the load can still be many times greater than what you'll get doing dedicated abdominal movements. To get even more core stimulation from other lifts, do them standing rather than seated or supported whenever possible, and choose free-weight versions over machines. "If you have a weight belt, use it on only your heaviest sets if needed; becoming over-reliant on one can actually weaken your midsection muscles including the transverse abdominis," says Team Cellucor athlete and trainer Cade Cowdin, a former college football player and the owner of Official Strength, a strength-and-development gym geared toward athletes in St. George, Utah. They may seem unique, but in many ways, the core muscles are like any other muscles. If you want them to get stronger or more muscular, ignore essential training variables such as exercise selection, load/intensity, volume, rest intervals, and training to failure at your own peril. However, the abdominals are slightly different from some other muscle groups in that they have a greater percentage of slow-twitch fibers than fast-twitch muscle fibers—hence the common recommendations that they should be trained with low weight and high reps. That approach has its time and place, but occasionally, it should be turned on its head. After all, just because you have more of one type of muscle fiber doesn't mean you should neglect the other—especially when fast-twitch fibers are the ones with the most potential for growth! 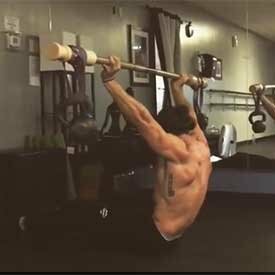 "With some bodyweight movements, you may be able to do 30 reps or more, which is far less effective for building up the bricks of your six-pack but increases muscle endurance more effectively," explains Cowdin. "For me, I find the lower end of the 10- to 15-rep range to be the sweet spot. 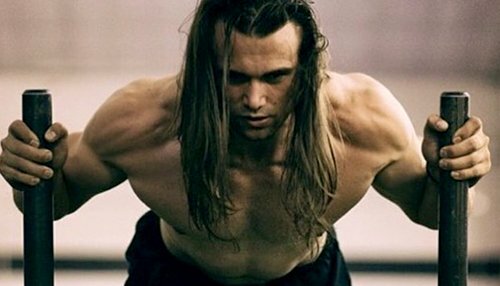 That's one reason loaded exercises are especially beneficial for making you stronger and bigger; you can use a weight that allows you to train in a low-to-moderate rep range." Of course this can go too far, leaving you struggling to perform just a few reps and losing sight of technique. "I don't go fewer than 10, because when a move is too heavily weighted, your motion shifts to completing the movement at the expense of the mind-muscle link," Cowdin says. It's worth noting, though, that just because you go fairly heavy doesn't mean you need to rest for minutes on end between sets like you would for squats. "Because the abdominal muscles are a fairly small muscle group and recover faster, you don't need to rest as long between sets," says Cowdin. "You can experiment, but I recommend about 45 seconds. Stay consistent with your rest time, though, because it'll be more useful to measure increases in strength." The biggest problem with bodyweight ab exercises is the inability to control the load. With weighted exercises, you can dial your rep range down or up depending on your training goal. 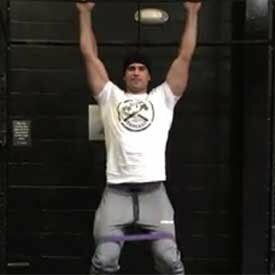 With Cowdin's help, we've come up with a short list of exercises that work great in that 10- to 15-rep range. It's not an exhaustive list, so feel free to add to it. While many of the movements allow you to change the load by adding more plates, others allow you to increase the degree of difficulty by changing a bench angle. And note that none of these are "isolation" exercises, so each will hit other parts of your abs in addition to their emphasis area. Upper-ab movements require your lower body to be stabilized as you bend at the waist to bring your ribcage closer to your pelvis. When you do this, the upper portion of the rectus abdominis undergoes a greater degree of shortening. This is the area below your six-pack that attaches to the pelvis. To target this region, stabilize your upper body and draw your pelvis in toward your lower ribcage, making the lower end of the rectus abdominis shorten the most. A good example is the hanging leg raise. Twisting at the waist or working in the lateral plane, such as when you bend to the side, engages the internal and external oblique fibers. Only the external ones are visible, but both play important roles in strength and safety during big lifts. Your TVA helps to stabilize your spine and hips, but it also compresses your abdomen, meaning it helps hold your gut in. Despite the fact that you can't see it, the TVA is still an important core muscle for strength and overall health. Every other movement here, plus every heavy lift you do! This wouldn't need stating for most muscle groups, but when it comes to abs, it seems like people love to ride out the same workout, rep by rep, for months on end. This type of comfort zone is your biggest enemy, because muscle adaptation stops taking place before long. Don't think your ab program is just a list of exercises you do for a predetermined number of sets and reps! To continue reaping greater benefits, push yourself harder over time by increasing either your reps or load. Careful record keeping will help ensure you're moving in the right direction rather than always repeating a workout you can already do. Let's get down to the details. From your pool of weighted ab exercises, choose 3-4 to build a routine like the one below. Cowdin recommends you start with the most difficult movement, or the one that's heaviest. It may take some trial and error to find this at first, but ultimately, you want to reach failure toward the lower end of the 10- to 15-rep range. As you become increasingly fatigued over the course of your session, you'll likely have to lower the amount of resistance to stay within that range. Stick with your ab workouts for about a month so you can measure progress and have the opportunity to increase overload factors. Randomly mixing up movements and order makes it more difficult to measure progress. After a month, change up the exercises and order—starting with lower abs, for example, or performing two movements from one group and dropping another group. Write down your weight and reps, but keep rest time between sets consistent. Remember, you're not training for a "pump" here, so this will feel different from a traditional high-rep ab workout. Even though the abdominals recover faster, Cowdin isn't a fan of training them every day. He recommends an every-other-day approach to offseason ab training, because you'll likely experience a higher degree of muscle soreness with weighted movements. Don't let this deter you! Keep coming back, and you'll see growth. 3-4 sets of 10-15 reps, rest 45 sec. 3-4 sets for 1 min., rest 45 sec.